A unique buoyancy configuration which ensures that the boat floats low in the water when on its side, thus facilitating righting. The boat floats on its side with the centreboard just clear of the water, and when righted retains a very modest amount, which can be evacuated via the self- bailers within a minute or so, even in light conditions. A centreboard is fitted – much more convenient than a dagger board, especially on a singlehander. The latest materials and techniques are used in the hull manufacture. The hull layup consists of carbon cloth with additional carbon/aramid or glassfibre reinforcement in areas liable to hardest use. The result is a hull which is extremely strong,light and long-lasting. Summary of standard fit-out: Allen Brothers fittings are used throughout. There are continuous control lines for kicker, Cunningham, clew outhaul and forestay, with cam cleats on the carlins, port and starboard. The centre mainsheet system incorporates a swivel jammer with ratchet block, and a height-adjustable rope strop. There are uphaul and downhaul lines for the centreboard. A custom alloy rudder stock, tiller and 1200mm tiller extension is supplied. Various options are available – see ordering page. The current OWNERS MANUAL is available here. One of the major features of the H2 is its light weight. In order to achieve this, a minimum amount of gel coat is applied to the mouldings and no scrim layer is added between the carbon cloth and the gelcoat. This scrim lamination is designed to minimise ‘print through’ of the cloth weave, but adds significantly to the overall weight. Thus you may well see signs of ‘print through’ on the laminates. This is normal, and is a feature of the lightweight laminate structure. The Hadron H2 has been tested by expert helms in winds up to Beaufort Force 6 (27 knots) and waves of up to 2 metres in height. However, sea state is dependent on many conditions, such as depth of water and tidal flow and it is an individual’s responsibility to sail in conditions in which he/she is competent. 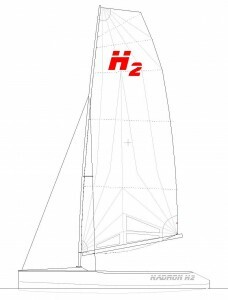 Hadron Dinghies Ltd reserve the right to change without notice details of the specification of the Hadron H2, as allowed within the Hadron H2 Class Rules.